Now researchers at MIT and Stanford University have found a new alternative for low-temperature waste-heat conversion into electricity — that is, in cases where temperature differences are less than 100 degrees Celsius. The new approach, based on a phenomenon called the thermogalvanic effect, is described in a paper published in the journal Nature Communications by postdoc Yuan Yang and professor Gang Chen at MIT, postdoc Seok Woo Lee and professor Yi Cui at Stanford, and three others. 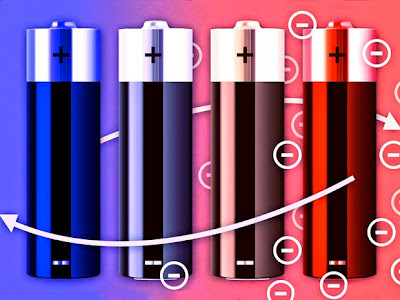 Since the voltage of rechargeable batteries depends on temperature, the new system combines the charging-discharging cycles of these batteries with heating and cooling, so that the discharge voltage is higher than charge voltage. The system can efficiently harness even relatively small temperature differences, such as a 50 C difference. To begin, the uncharged battery is heated by the waste heat. Then, while at the higher temperature, the battery is charged; once fully charged, it is allowed to cool. Because the charging voltage is lower at high temperatures than at low temperatures, once it has cooled the battery can actually deliver more electricity than what was used to charge it. That extra energy, of course, doesn't just appear from nowhere: It comes from the heat that was added to the system. The system aims at harvesting heat of less than 100 C, which accounts for a large proportion of potentially harvestable waste heat. In a demonstration with waste heat of 60 C the new system has an estimated efficiency of 5.7 percent. The basic concept for this approach was initially proposed in the 1950s, Chen says, but "a key advance is using material that was not around at that time" for the battery electrodes, as well as advances in engineering the system. That earlier work was based on temperatures of 500 C or more, Yang adds; most current heat-recovery systems work best with higher temperature differences. Chen, the Carl Richard Soderberg Professor of Power Engineering and head of MIT's Department of Mechanical Engineering, says there's currently no good technology that can make effective use of the relatively low-temperature differences this system can harness. "This has an efficiency we think is quite attractive," he says. "There is so much of this low-temperature waste heat, if a technology can be created and deployed to use it."